Will your class escape in time? Try this escape room game with your students today! This is a fun game that is perfect for reviewing comprehension. Students will be visiting different countries all over the world, and learning about their Christmas traditions. This game is intended for lower elementary students in first grade or second grade. This is an interactive game where the students are timed. This game is intended to be played as a whole class, with the teacher leading the game. Students are trying to save Christmas by finding Santa’s lost toy bag. Students must solve a string of questions and clues, as well as decode different ciphers to escape. Students try and solve clues and questions to escape the classroom. You, the teacher, can decide how much time your students have to complete the task. I suggest 60 minutes, but it is up to your discretion. You can even split the time up and play 30 minutes one day, and 30 minutes a second day. Also, you can project a timer for your class, or put one somewhere for all the students to see, so they can keep track of how much time they have left to complete their task. Looking forward to using this! My students LOVED this resource last Christmas!! When it’s hard to keep them focused during the holiday season, this was a fun break from the mundane! Thank you for creating this resource!! Can’t wait to use this in the Fall. This was absolutely so much fun! Excited to try this with my class! Looks like a lot of fun. Thanks! These are so much fun!! Thank you! This is a really fun activity! My students loved it! My students loved this! Thank you! My kids loved trying to crack the code! I loved using this with my second graders! It looks well thought out. I made all the packets, but didn’t have time to do it with my class. Hopefully next year! Another great activity! Thank you! A fun activity! It fits very well with any Holiday Around the World unit. Nice way to end the week before Christmas break! Thank you for the clear instructions, hope to use this year! The kids had such a blast! My kids loved this and it was easy enough for them to understand. They were disappointed when it was finished. My students had a blast with this! My students enjoyed this. Once you prepare everything, you can use it over and over again. I can’t wait to use this with my class! My class loved this! The instructions were great and very easy to follow. This is one of the best holiday products I’ve purchased! My kiddos loved the movement this activity allowed and really enjoyed being problem solvers to crack the code! My kids love Escape Classrooms. This was a fun scavenger hunt. My students had GREAT fun while learning about Christmas activities around the world! 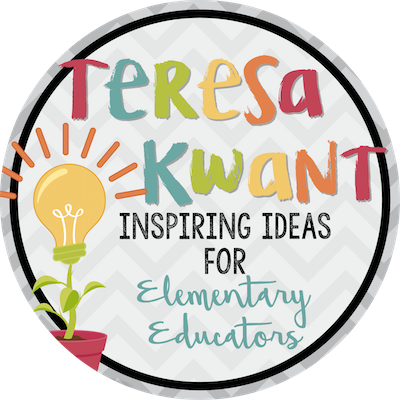 Love these resources. I wish I had more time in my day to do these more frequently. I used this for my 2nd grade Brownie Troop xmas party and the girls loved it!!!!! My kids LOVE LOVE LOVE these!!! They ask about them all the time and look forward to cracking the code at every holiday. Thank you for your time and creativity! The directions are SO clear and easy to understand. I can prep the entire activity in about 30 minutes. I love this product. My students had so much fun cracking the code. They worked as teams and were up and moving around. I love your creativity and so did my students. This activity made learning so much more fun! Love all of these escape rooms! Great for 3rd graders! The children were so engaged. Thank you for a great product! This was a fantastic activity before Christmas break! It kept the kids engaged and learning up until the last day! A great way to wrap up our unit on different holidays in December! A great way to spend the day before break! This was amazing ! The kids had a blast !!! My students loved this! I purchased the other version as well so every student could participate and be successful. Thank you. Our students had a blast with this activity! Very thorough and easy to put together. I tried it with students who were too young, but can’t wait to try it next year with older students. Love it! My principal did my formal observation when I was doing this and she loved it! The students learned so much working with each other on it. This was so much fun for my class! They got so into it and it was our favorite activity the week before Christmas break! So fun and informative. Really thorough as well. Thank you! My class did this with their buddy class and had a lot of fun! This is a create activity. Took some time to prepare but worth it! Love this! Thank you! Keep making them! AWESOME resource! Loved watching my little learners learn! This is a great activity! SO much fun during the holiday madness!!! AWESOME!! We loved this so much! This was so fun! My students loved it and so did I. I can’t wait to do a different one!! So fun, I’m excited to try more. I had to help my second grade work through this all together in one group. Worked well with my class … just a little confusing for the kids at some points with what responses went on the paper and what would lead them to the next clue. Pictures were a great help to put this together! I loved this packet. It was perfect for our Class Party day. The directions and pictures for assembling were very helpful. Thanks for your time and effort. Very well done! These are so much fun for my students. I have to purchase more soon! My students had so much fun with this activity! Needs a lot of prep work. Fun resource though. My students had fun doing this activity. Great resource. Students had a ball with it. What a creative and detailed activity! We had a great time doing this with our first graders. Thank you! Went perfectly with our Holidays Around the World Unit. Was a great activity for that last day of break! My kiddos love these. My class and I had so much fun doing this! It was fantastic. The directions made what I thought was going to be a difficult setup easy. We had so much fun doing this! My students were so engaged! My student’s absolutely loved this activity. It took a little coaching to get them to understand the steps they needed to take to get to the next clue but they finally figured it out. They were not able to complete the escape room in the allotted 60 minutes but I think they’ll get it on the next one. Great product! We enjoyed playing this after a week long study of holidays around the world. It was a lot of fun! Thank you. My students had so much fun completing together as a group. Thank you! The kids had so much fun doing these activities! It’s a little hard to set up, but the instructions are super explicit. We loved the activity and I am definitely looking to do more with my class. 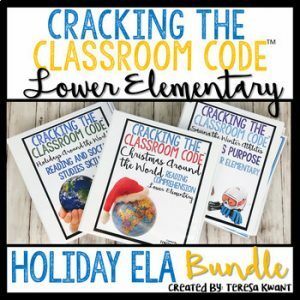 I loved your other crack the code activities and can’t wait to try this one! My students LOVED this product! This was a great activity during our final days before the holiday break. The students were engaged and enjoyed the activity! This was a fun activity to do right before winter break! Fun activity before break that tied into our holidays around the world study. This was so fun for my students! Time consuming to print, cut, and set up! But, my students had a lot of fun! My students loved this activity. A fun way to learn indeed. I did this with all 4 2nd grade classes, They loved it! This was our first experience with Crack the Code activities. The directions are very well thought out and were easy to follow. I did this with my class as a whole group and it was great. They loved it! Great resource and the students think it is fun! This was so fun! My kids loved learning about other traditions around the world! The pictures you provided for assembly were wonderful. Made it so much easier to put together. It was a lot of fun. This product was just what I was looking for. My students were super engaged and loved doing these our last day before winter break. They absolutely loved the emoji codes. My students love doing these!! This was a lot of fun , although confusing to put together. It was a lot of work to put together overall great. I didn’t get a chance to use this product but have it all prepared for next year. I think it will be great! My grandchildren had fun using this over the holidays. We ended with an English cracker prize for all! Clear instructions include pictures (which I needed). Takes some set up, but worth it. Super fun way to work together and crack puzzles together! The students loved this! It kept them completely engaged. I absolutely love all of your classroom escapes and so do my students! GREAT! My students had so much fun with this! Great activity for the kids close to break and a sanity saver for the teacher. They loved it!!! We loved this. Thank you for such a fun resource! My 2nd graders were a little confused about when they were supposed to write things down on their recording sheet, but they enjoyed the game! Next time, we may skip the recording sheet and just solve the clues. The students were happy to “save” Christmas, and they were even happier to discover a hidden Santa bag filled with a little gift from me at the final clue. Excellent and fun activity. Great way to assess students’ learning and needs. We had so much fun adding this to our activities the week before break. I really like these types of activities! They are really engaging for students! Thanks! My students had so much fun cracking the code. Thank you for sharing this fun activity! Thank you for creating an engaging resource. Exactly what I was looking for for my class! I’ve done some math Cracking the Codes with my class and they absolutely love them! Can’t wait to try a reading one with them! My kids are so excited to do this activity this week! We are doing this with our 3rd grade buddies! I can’t wait to use this! My students will love it! How can you not love this holiday version of crack the code?! My students loved this. Gave them something new to do to help with comprehension. I think that the QR codes are missing on two of the sleighs. Can you send me an updated version? Thanks so much! Looks fun can’t wait to try next week with my class! This looks like so much fun, I can’t wait to try it! My students had so much fun with the Thanksgiving Escape Room they have been asking me constantly to do another one! I am fulfilling their wish and have purchased this one as well!! I know they will have so much fun while learning!! I cannot wait to do this with my class. It looks fantastic. This will be a great ending to our Christmas Around the World unit. Thanks! Excited to use this one in the classroom too! Great Resource!! Excited to try this. This is my morning activity for our last day of school before Christmas break! We’ve been talking about Christmas Around the World so this will be the perfect culminating activity. I can’t wait to share this with my kindergarteners! If you haven’t tried one of these escape rooms, please rush out and purchase them. They are fantastic! Also, more Kindergarten ones would be greatly appreciated. Instructions were clear on how to set up. Can’t wait to use this! This is a product we will LOVE using next week! I think the kids will have fun with it! We’ll enjoy doing this before break! I’m so excited to use this with my kiddos. There don’t seem to be many targeted for the lower grades. Thank you! Can’t wait to try with my kids! My class loved this! Looking forward to purchasing more like it! My students absolutely LOVE doing these escape room activities. They are always asking when we are doing another one. I am so excited for my students to use this in second grade! These are so amazing! Thanks! I’m excited to try this version out with my class! Cannot wait to use! This is my third crack the code! I love your products! I can’t wait to try this one with my class! Can’t wait to use this with my 2nd graders in a couple weeks! This is really an awesome activity. I can’t wait to use it with my class! Thank you for another great product! 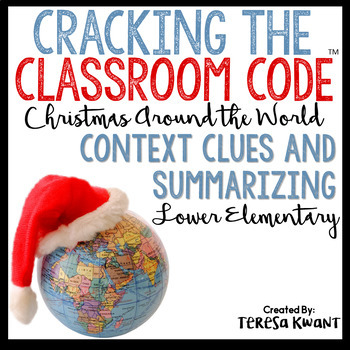 This goes great with our Christmas around the World rotations! Fun lesson that goes with the standards! My class LOVED the Halloween and Thanksgiving Cracking the Classroom Code, so I have no doubt that they will love this one as well. Thank you so much! I loved Teresa’s Escape Room freebie so much that I purchased three more! I can’t wait do do this with the kids! Thank you, I can’t wait to use this packet! Can’t wait to try it with my class ! Thanks for sharing ! Very easy to follow! I can’t wait to use this for our Christmas party! Excited to use this soon! This will be so much fun! Can’t wait to try it with my students next week! Looking forward to using this right before break! So detailed and easy to use! I’m so excited to do this with my students when we finish our Christmas Around the World unit. This looks fun. I can’t wait to try it with my class. Thanks! Wonderful activity that is well thought out! I can’t wait to use this with my students! Thank you! Looking forward to doing this with my class this year. Cannot wait to get started. Thanks! I love everything about these! Great activities for whole groups! My class cannot get enough of these. I am so excited to try this!! This seems like it will be a lot of fun and very engaging. Can’t wait to try it with my class. THank you! Excited and a little nervous…this will be my first Cracking the Code activity! The class and I will eventually own all of these! Can’t wait to do this with my class. Takes some initial prep work, but a lot of fun. Well organized. Can’t wait to try it! We completed the Halloween Crack the Code as a class in 1st grade and my students LOVED it! Can’t wait to prep and use this holiday version! Looks wonderful. Can’t wait to use it!! I can’t wait to use this with my students! It will save my sanity in the last week before the holiday break! So excited for this. Purchased it and put it together this afternoon. Can’t wait. So much fun! Thank You!! Can’t wait to use this! We did the zombie escape at Halloween and can’t wait to do this one before Christmas. The kids had a blast and it was so much fun watching them find the envelopes. Can’t wait to use this! Please keep them coming for the lower grades. Keep them coming…my students love these! Cannot wait to use this!